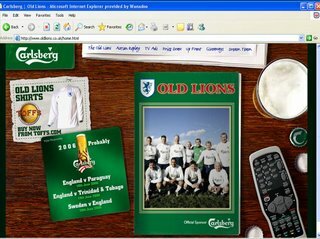 Winning the advertising world cup..
Saatchi & Saatchi’s ‘Old Lions’ is a natural extension of the ‘Carlsberg don’t…/probably’ positioning. It is especially notable for the interactivity of the spot – being able to press the red button to view a full length version of the spot is a great move, especially in such an inspired shoot – the players looked as if they were having a great time. Mother’s ‘Goal!’ spot for Coca-Cola really communicates the passion which the football fan feels, something which the rest of the World Cup ads ignored, for one reason or another. It’s also probably the most original execution out of all of the ads, with the claymation esque figures detailing the pure joy that football can bring. The above link is for the full 45 second execution; it’s great. To quote Alan Partridge… “back of the net”. ← Simple things breed simple minds. Or not. Thanks!I agree about the Coke ad actually. The first decent ad they’ve had since about 1993.Some of the recent Carlsberg ads have been getting weak or predictable, but the Old Lions is brilliant. The full version is funny and immensely watcable.